Lithuania is a Baltic nation with 55 miles of coast with the Baltic Sea. On land, it has 4 neighboring countries: Latvia, Poland, Belarus, and the Russian exclave of Kaliningrad. Language and Alphabet: Only two Baltic languages have survived to modern times, and Lithuanian is one of them (Latvian is the other). Although they seem similar in some aspects, they are not mutually intelligible. Much of the population of Lithuania speaks Russian, but visitors should refrain from using it unless it's absolutely needed - Lithuanians would rather hear someone attempt their language. The Lithuanians also don't mind practicing their English. German or Polish may help in some areas. Lithuanian language uses the Latin alphabet with some additional letters and modifications. Religion: The majority religion of Lithuania is Roman Catholic at 79% of the population. Other ethnicities have brought their religion with them, such as the Russians with Eastern Orthodoxy and the Tatars with Islam. 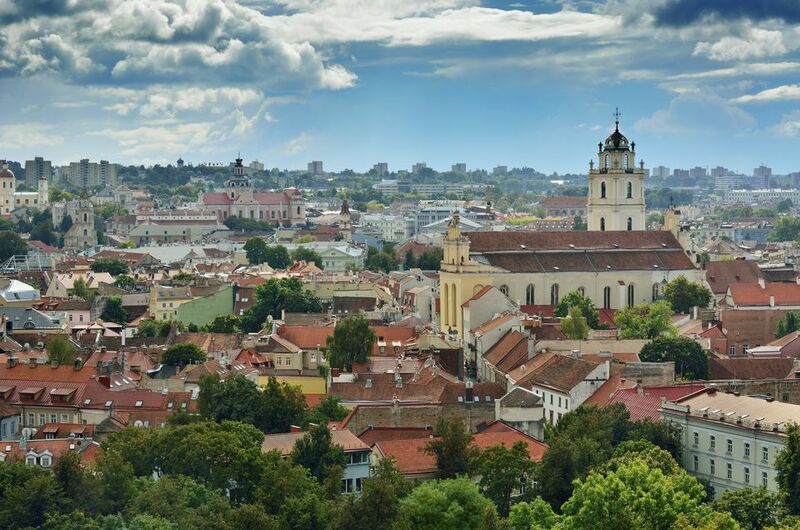 Vilnius is a cultural center in Lithuania, and fairs, festivals, and holiday events take place here regularly. The Vilnius Christmas market and the Kaziukus Fair are two examples of large events that attract visitors from all over the world to the Lithuanian capital. Trakai Castle is one of the most popular day trips visitors can take from Vilnius. The castle serves as an important introduction to Lithuanian history and medieval Lithuania. Lithuania's Hill of Crosses is a significant pilgrimage site where the devout go to pray and add their crosses to the thousands that have been left by other pilgrims before. This impressive religious attraction has even been visited by popes. Visa Information: Visitors from most countries can enter Lithuania without a visa as long as their visit is under 90 days. Airport: Most travelers will arrive in Vilnius International Airport (VNO). Trains connect the airport to the central train station and are the fastest route to and from the airport. Buses 1, 1A, and 2 also connect the city center with the airport. Trains: The Vilnius Railway Station has international connections to Russia, Poland, Belarus, Latvia, and Kaliningrad, as well as good domestic connections, but buses may be cheaper and faster than trains. Ports: Lithuania's only port is in Klaipeda, which has ferries that connect to Sweden, Germany, and Denmark. Lithuania was a medieval power and included parts of Poland, Russia, Belarus, and Ukraine within its territory. The next significant era of its existence saw Lithuania as a part of the Polish-Lithuanian Commonwealth. Though WWI saw Lithuania gain its independence for a short while, it was subsumed into the Soviet Union until 1990. Lithuania has been a part of the European Union since 2004 and is also a member country of the Schengen Agreement. Lithuania's colorful culture can be seen in Lithuanian folk costumes and during holidays like Carnival.